Autumn is all about colourful landscapes, open fires, comfy knitwear and cosy nights in with a book (or bake off). One of the most beloved coffee seasons of the year will soon be in full swing! As the days get shorter and the mornings colder, our coffee gets darker and our mugs get warmer. So put down the iced coffee for a while and embrace the tea cosy and coffee syrups. Autumn is a time for good old fashion traditions and comfort. Too easy to pass up. Nutmeg is a staple spice in any UK home. Nutmeg is has a very distinctive scent and a warm, slightly sweet flavour. Perfect for adding to your coffee this season. Just grate some fresh nutmeg straight into your morning coffee or latte! If you don’t have nutmeg seeds, pre-ground nutmeg will do just fine! This spice is used by many every year to ‘spice up’ their morning pick-me-up. Elizabethans believed nutmeg warded off the plague, we just believe it makes our drink taste great! Also, nutmeg goes really well in tea, especially black teas. So enjoy experimenting, but be careful not to have too much in your diet. Small amounts are harmless but larger quantities of nutmeg can be toxic. Instead of sugary sweeteners, consider trying a little maple syrup in your coffee! A totally natural (and delicious) sweetener that most of us have in the house already. Simply swapping your sugar or sweetener for this sweet stuff will give a rich and autumnal feel to your java. Fancy a touch of morning Mocha? why not try some Nutella sauce in your cup of joe. To do this simply, heat up a small spoonful of Nutella with a little cream and whole milk to thin it out. Then, add cocoa powder and a dash of vanilla. Once the syrup is ready, you’ll want to have it on everything, but just make sure you drizzle it into your coffee first. For an extra treat try topping the cup with whipped cream and a sprinkle more cocoa powder. mpkin spice and apple pie, cinnamon can give your coffee an extra cognitive boost. One study showed that the mere whiff of cinnamon can boost memory for small tasks. Another study showed that half a teaspoon of cinnamon a day has been shown to reduce your blood sugar and cholesterol levels. Cinnamon can curb food cravings and contains the powerful antioxidant manganese. Due to these properties it is often used in herbal teas, but not many people realise it can be tasty in your java too. We think it tastes great, so try substituting cinnamon for sugar and cream the next time you have a cup of coffee, and let us know what you think! We love syrups in our coffee, tea and cocoa. 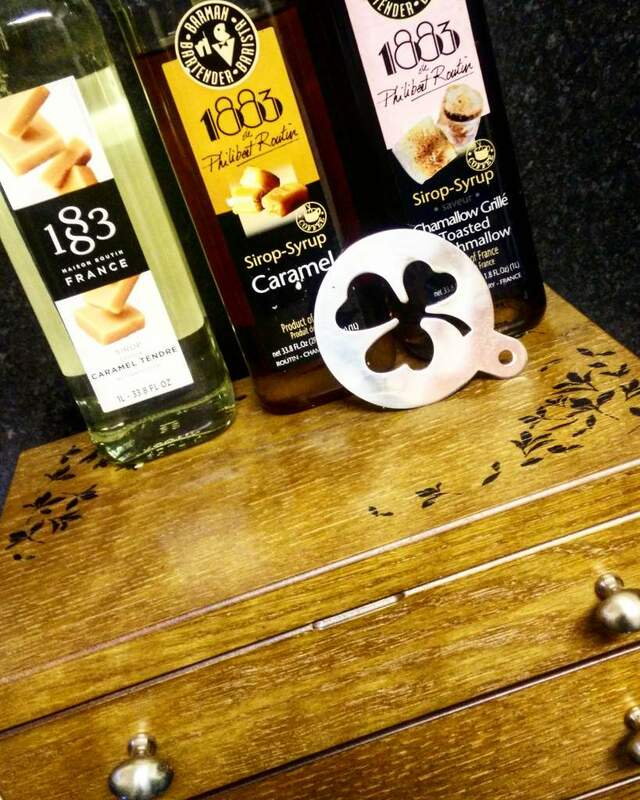 Syrups are available in all different flavours to compliment all palettes. Everything from caramel to toasted marshmallow, and everything in between. These simple syrups can add sweetness to a bitter brew. Want something completely new to try? take a look at our exciting autumnal recipes for a new staple drink you can make at home! If we were to choose one drink that has captured the psyche of the avid Autumn coffee drinker, then it has to be the Pumpkin Spice Latte. This drink seems to sell the best in most coffee chains at this time of the year. So here goes, to make this classic autumnal drink at home you will need. Combine the syrup with the espresso in a mug. Pour in the steamed milk, doing a latte art design if you can! Finish off the drink by topping with a dusting of cinnamon, some whipped cream and some ground pumpkin seeds to add a different texture. If you are not a fan of our friend the pumpkin, or you want to try something different this season, try a Salted Caramel Latte. Made with caramel syrup and a pinch of sea salt, topped with whipped cream. Add the syrups to a freshly brewed double espresso and then top up with your steamed milk. The caramel and pumpkin flavours combine brilliantly, delivering a new flavour that’s recognisable, but very hard to place. Just like a true Black Forest gateau, this drink combines the flavours found in the pud. The Gateau consists of a number of layers of chocolate cake, whipped cream and cherries that is all topped off with even more cream and cherries. Delicious! Now, make that into a tasty latte! Pump the syrups into the espresso and then add the foamed milk until the glass is about two thirds full. Add a generous helping of whipped cream before topping with a mixture of cherries and chocolate shavings. Instagram your pics and tag us! Wow, amаzing weblog structure! How long һave yoս ever been running а blog for? you made bⅼogging look easy. The total glance of your website is magnificent, let alone the content!